As our teacher’s initiative, there is a tradition in Tartu Veeriku School called “From Friend to friend“, where fourth graders help first graders to learn how to use computers. This should help computer lessons to go smoother and be more effective. In 2016 we piloted project named Speed with 3rd grade within the broader framework of which we used different technical solutions. The theme of the project day and science lesson was Speed. There were 4 teachers involved in this projects. Before the project day students learned different things in different subjects that they needed to know in particular programmes. In mathematics they learned how to calculate average, in art lessons they made racing track and in English lessons tehy learned the vocublary what they needed to know in Lego WeDo 2.0 applicaton. During the project day students had to do worksheets about measuring the response speed and about calculating the speed of the car. At the beginning of the project day classes were divided into two. One half went to language lab to work with Makey Makey to calculate reaction time and other half went to Samsung digital class, where they measured the speed with the help of Lego WeDo 2.0 application. In measuring reaction time pupil had to investigate if they react faster to listening tune or seeing out. In order to controll that, they used Makey Makey devices to create easy test device, what reacted to touching. All of the addresses they had to search info from had been given in their tests. They also had to calculate avarage values of answers, based on what they got to know what kind of reaction is better - is it hearing or seeing. 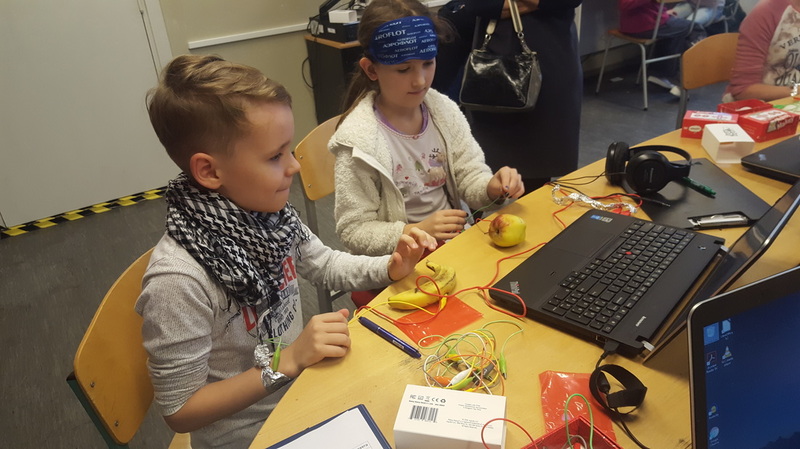 After what they could make some music as an additional task by the same programme – Makey Makey. It was really a great lesson for students. Other half of the class went to work with Lego WeDo 2.0 programme. They could play the role of car designer and also they learned what type of wheels run faster. In order to make such kind of test children had to bulid different kind of wheels for cars first. Later they had to measure the time of their passage. All the disdances what cars had passed were measured with tape line. Later the average values of speeds of different cars were calculated. From the results children had to choose what kind of car designe was the best. At the same time teachers analyzed, what kind of learning ability and learning skills this kind of project should improve. Later, when teachers asked feedback from classes, it was a pleasure to recognize that tasks were really nicely presented. The next quarter the same project was carried out with other third grades. Now we are already working with new subjects to create analogical project day. Applying grading systems that encourage studying, we connect different subjects. This helps both the teachers and the students to improve their knowledge of technology and increases the parents' awareness of its usefulness.It also helps us to change how studying is traditionally handled, encouraging teamwork for studying, by including all parties (teacher, student and parents) and widening the studying possibilities. Teamwork inspires and motivates participants to share their love of discovery and studying. On 25 January 2017 the students of the 3rd grade took part in digital learning game QWERTY. 18 students from different schools participated in that event. The aim of the project was to widen students' vocabularies and digital literacy and to provide teachers with a chance to enrich their lessons. Kahoot Jumble, LearningApps, Quizlet Live and 10 Fast Fingers were the games that were used in the event. The students showed their skills in using computers, different programmes and their knowledge of vocabulary. The supervisors of the students also got to learn about the evolution of new programmes. Games were played alone, in pairs and in groups. Every participant received an award. The event was supported by the city of Tartu. On 22 September 2016 the traditional hiking day from 4th to 9th grades took place, this time using smartphones or tablets all the way through the city. The tour started at school, continued through the city and ended in Raadi park. Students were divided into groups, so that each group had at least one smartphone or tablet. All devices were brought by the students. 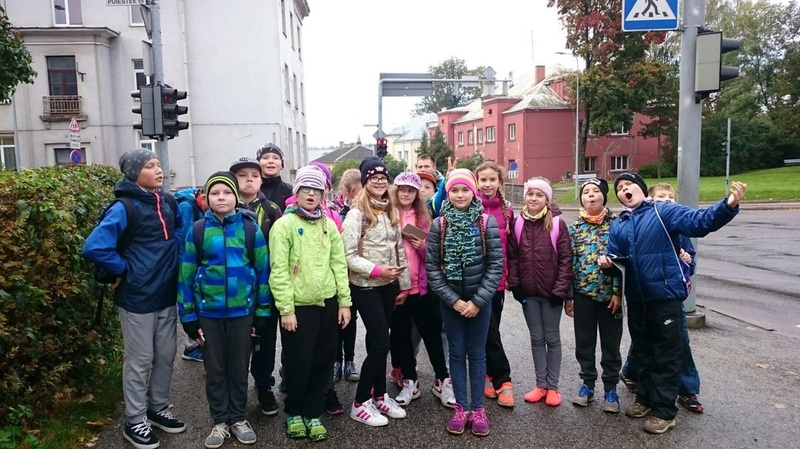 To go throught the hikingroute, the Actionbound app was used, which guided students from location to location, simultaneously quizzing them on the city of Tartu and asking them to solve different exercises. Most of the students found the day to be a success and that this was a great way to explore the city and should be repeated in future. The project took place in 2013/2014 as an integration project in literature, art and geography. All the students of 8 A in Tartu Veeriku School took part in the project and they were instructed by teachers Riin Grossman (Literature), Reet Tallo (Art) and Priit Pensa (Geography). Finishing touches to the big wall map were made at the beginning of 2014/2015. The work was split into several stages. First, the students were all randomly assigned up to 3 chapters to read and describe. The aquired material had to be introduced to classmates in literature lessons. As a result a thorough overview of the book was made. In art lessons an illustration along with a citation from the read chapters was made by each student. In geography lessons, a small map depicting Nautilus’ journey as well as all the names of the geographical objects mentioned in the book was sketched. In addition, a big wall map, consisting of data from the minimaps, was created in art lessons. As the last stage of the project was a big wall map that portrays the voyage of „Nautilus“ , as it was described in Jules Vernes novel „20000 Leagues Under the Sea“. The map was made in art lessons under the instructions of Reet Tallo. The illustrations and the small maps that were used to make the wall map, were all made by the students. All the students participated in composing the wall map. The process was divided into different phases, which were executed by groups of up to 4 students. Each group had their own indivdual task: drawing map contours, colouring the map, grid placement, marking book related place names onto the map, applying Nautilus’ trajectory onto the map and adding finishing touches.